I. Logan Paulson – Coming into the season many experts predicted it would be time for Fred Davis to finally break out. However this was far from the case as he scored 0 touchdowns in 7 games before he went down with a season ending Achilles injury. The Redskins then scrambled to find a replacement, even signing the previously cut Chris Cooley. As it turns out the guy they were looking for was already on their roster. Logan Paulson stepped up and caught some huge passes to end this season including a playoff touchdown. Paulson proved he deserves to compete for major minutes in the NFL. II. 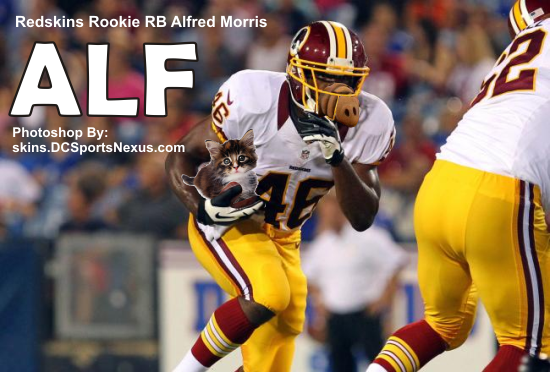 Alfred Morris – What do fantasy experts tell you about Redskins runningbacks? Don't draft them. But you didn't listen and drafted one anyway. Whoops. You scooped up Roy Helu Jr as a sleeper pick. Whoops again. Coming into the season Helu was expected to carry the load as longshot 6th round draft pick Alfred Morris was fighting to make the team as a fullback. As it turns out Alf outplayed everyone in the preseason, earned the starting role, and ended up as the NFLs 2nd leading rusher, only behind Purple Jesus himself. How does that 1600 yards and 13 TD's taste fantasy experts? III. Santana Moss – For the longest time Santana Moss has been a staple in the Redskins offense. Year after year he was as consistent as could be. However after turning 33 in the offseason the Redskins signed 2 big free agent wideouts. Santana was being phased out...or was he? Santana ended up catching 8 touchdown passes, the most he's ever had in one season as a Redskin! His receptions may have been down but he was definitely one of RGIII's favorite redzone targets. The old man showed that he still had gas left in the tank.